Hi, I’m Sandra Smiley Carrique. My father founded Smiley’s Glass in 1963 providing his customers with the finest automotive glass replacement available. I am proud to say that we continue to be a local family owned and operated Mobile Glass Shop providing the finest, safety oriented auto glass installations in Central Virginia. 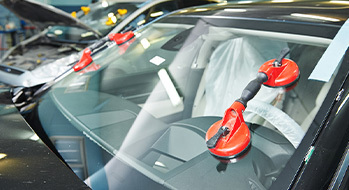 We follow the Auto Glass Safety Council’s AGRSS windshield replacement process which guarantees that you are getting only manufacturer tested and approved methods and materials. Each step is designed to ensure the safety of the vehicle’s passengers. We guarantee all our workmanship and make every effort to provide service within 24 hours, weather permitting. And as an extra touch, after we finish installing your brand new windshield, we make sure to clean up after ourselves from the front seats up. So now you can enjoy your new installment to the fullest. When my father founded Smiley’s Glass, not only was he intent on being the best, but he had an idea that was brand new at the time. How about performing auto glass replacements at the customer’s home or business instead of requiring the vehicle to be brought to the shop? That idea sprouted an entire industry! It’s never been easier to give food to the needy. Just pick up the phone and call SMILEY’S Glass for FREE pick up at your home or office. Automobile manufacturers put great emphasis on a vehicle's windshields to ensure your safety. Doesn't it make sense that its replacement be performed correctly? Since 1963, SMILEY'S has been committed to your safety and satisfaction. A detailed windshield installation procedure specifically created to ensure your safety.